leaves were done in Wild Wasabi. I hope you can enjoy the white mum flowers that were embossed with white embossing powder on the whisper white cardstock This created an embossed resist when the other flowers and leaves were stamped over the embossed image. 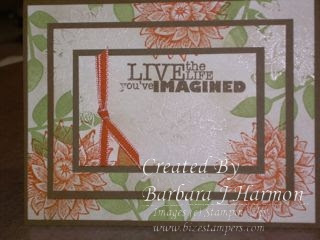 The saying " Live the life you imagined " is one of six stamps from a new stamp set Really Good Greetings found on page 38 of the new catalog. The six stamps are only 14.95 if you buy them to apply to acrylic blocks. More great cards will be featured shortly. Happy Stamping !